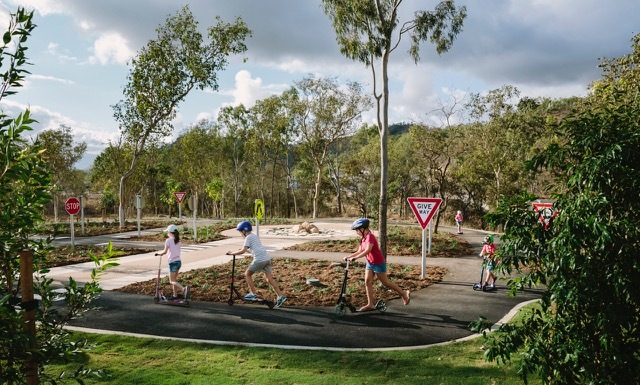 Wadda Mooli means ‘welcome’ in the Bindal people’s language – and what a welcoming recreational space our bespoke playground offers to this new Lendlease community. On entering this new development residents are greeted by a “beacon” art structure which is the key influence and landmark of the development. 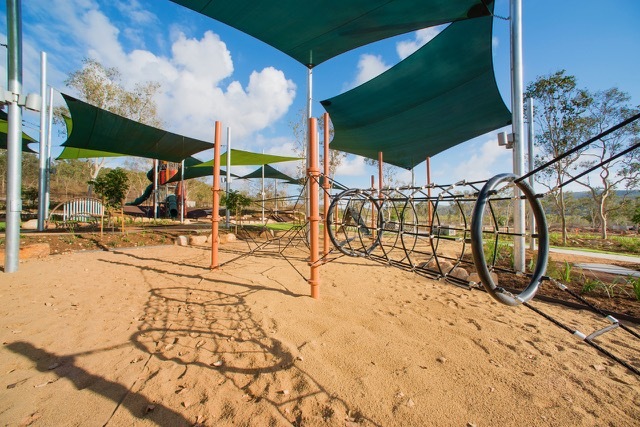 This formed the aesthetic of our custom designed and built 11m high tower that is the centrepiece of the all-inclusive playground. 10m high Australian hardwood posts adorn the outside of this tower with cladding themed from the “beacon” adding to its striking appearance. 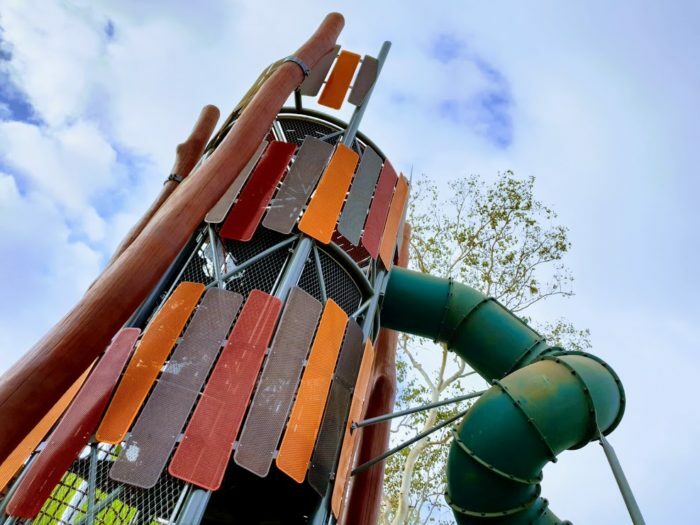 But it’s the play value that the kids really care about with an internal spiral net and belt climbing concept setting the challenge to reach the slides set at 2m and 6m high. Stainless steel mesh encloses the tower for the safety aspect while still providing clear sight lines from both inside and out. 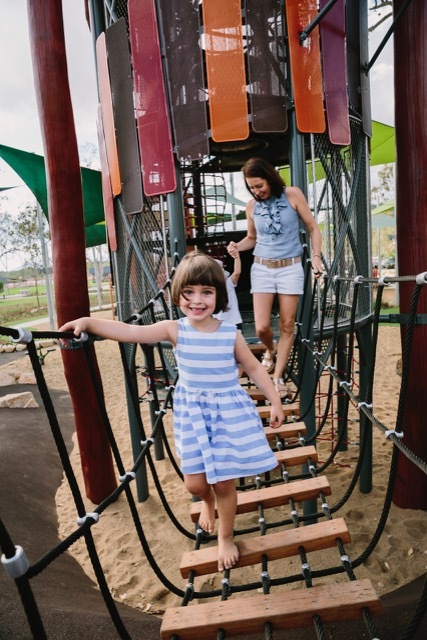 The play environment has a lot to offer for all ages and abilities. 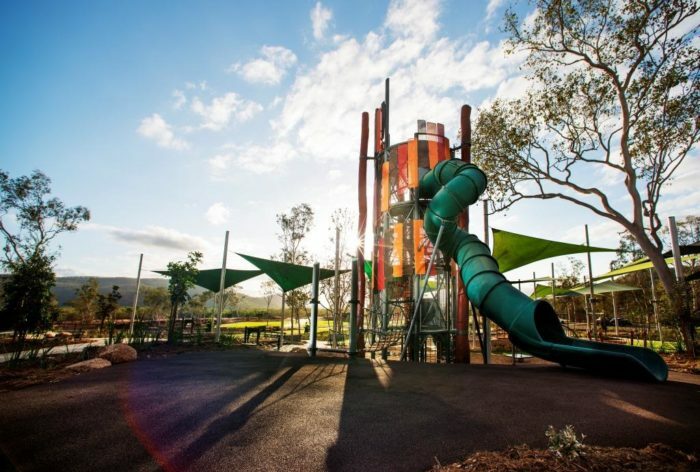 Additional climbing is offered in a more obstacle style net and belt setup, and sliding fun for younger players not quite brave enough to climb the tower is provided on the double embankment slide, allowing children to race each other and slide together. 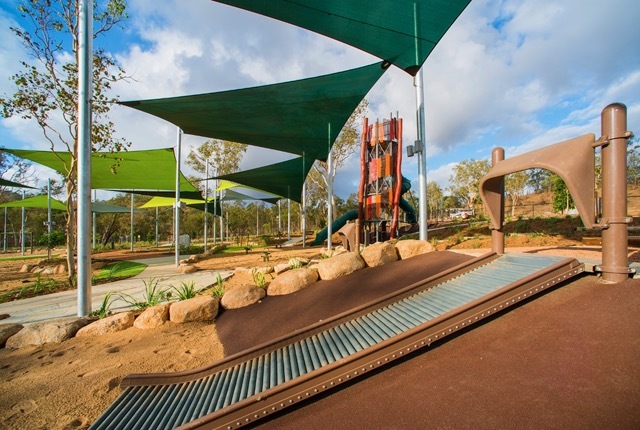 Our unique embankment roller slide has also been included, offering deep tissue stimulation for users (as well as fun bumpy vocals on the way down). 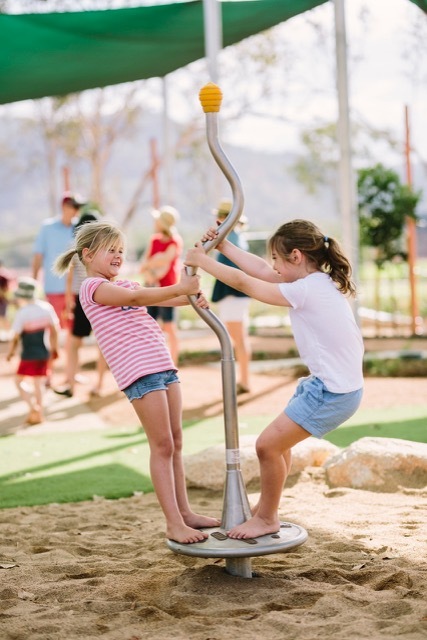 3 swings means there’s less waiting for this essential vestibular activity, and our inclusive orbit with wheelchair accessible bay is awesome for all ability multi user spinning. 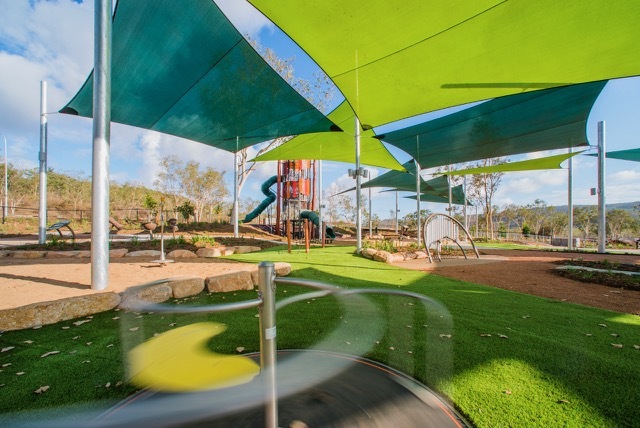 Shade was a big focus for the park owners in this hot climate and the entire park is covered by a stylish shade sail canopy to ensure families can play sun smart and safe. 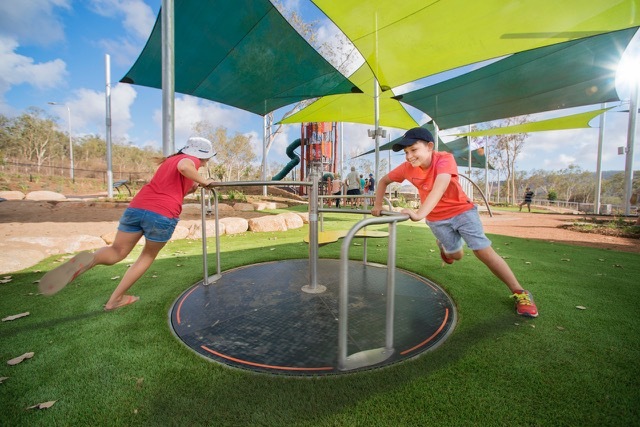 Playscape Creations worked hand in hand with Lat27, Lendlease and Touched by Olivia Foundation on the creation of this truly amazing bespoke playground. 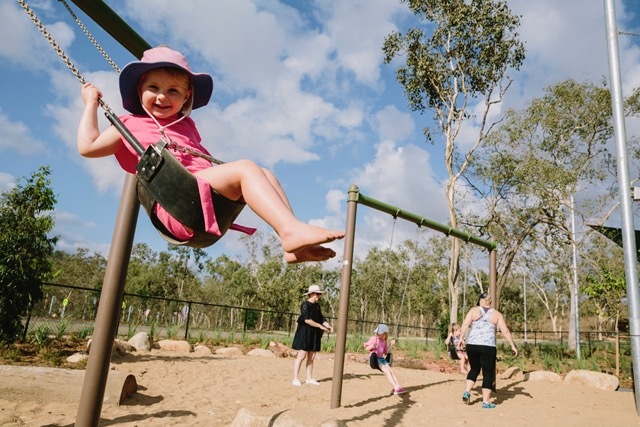 The park is the key destination for the new Lendlease development and provides this new community with a broad range of facilities alongside this fully inclusive adventure playground. 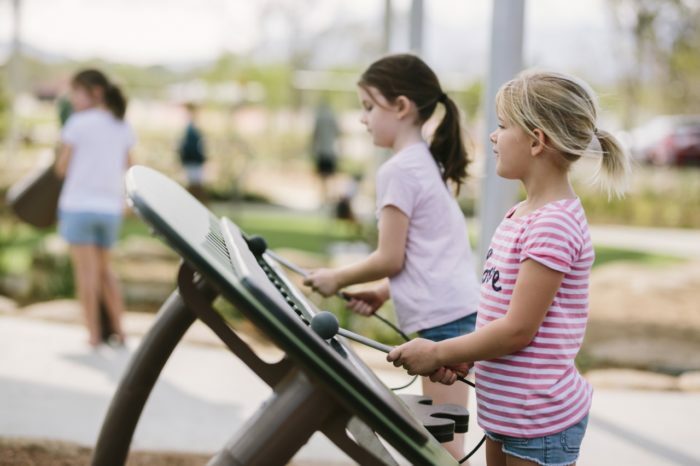 BBQ’s, shelters, basketball hoop, junior sports field, dog offleash area, and learn to ride and mountain bike skills areas truly promote something for everyone to get outside and be social and active. 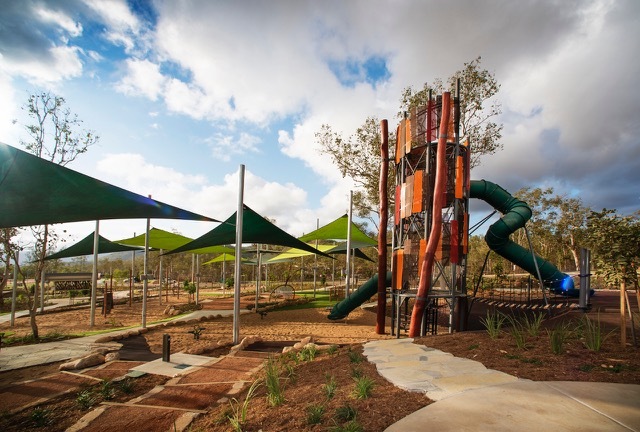 The park is also the starting point to a nature trail to Bindal Ridge – a 234 ha conservation zone. A fantastic offering for all. 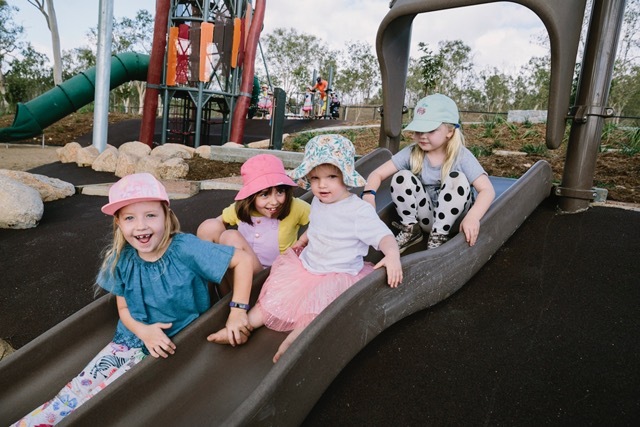 Thank you Lendlease for the great photos! !